Monster Musical Chairs - The same game you remember as a kid but you play Halloween Music and everybody is dressed up in their costumes. Set up one less chair for the number of people playing (ex.5 chairs for 6 people) in a straight line or back to back. Start the music and tell guests to slowly walk around the chairs. When the music stops players compete to sit in a chair. The person left standing is eliminated from the game. Remove one chair and repeat the process. The person who successfully finds a chair each time wins. Fun for guests of all ages. Apple Swing Game - Last Fall we ran a contest and asked visitors to submit their ideas for party games. A visitor from North Carolina submitted a game called the Apple Swing Game. When I read it I thought it would be perfect for a Fall or Halloween Theme Event, especially if kids are involved. Read more about the Apple Swing Game here. Candy Corn Toss - Divide guests into teams of two. Give each team 10 pieces of candy corn and a shot glass. One team member holds the glass near their belly button while the other team member tries to toss candy corn into the glass. Players should stand about 6 feet away from each other. Each team member tosses 10 pieces of candy to see how many they can get into the glass. The team with the highest number wins, 20 being the highest. Halloween Charades - You are probably familiar with the traditional charades game where team members take turns acting out certain things like movie or book titles without talking. Well this Halloween version is similar but players have to act out familiar Halloween characters in unfamiliar situations like Lady Gaga begging for change and Batman flying a kite. This downloadable game comes with 30 characters and 4 blank cards in case you want to fill in your own characters. Buy as part of the Printable Games Package below. Halloween Costume Word Search - Everybody loves word searches especially if there are prizes involved. Personally I'm pretty darn good at them! Three word searches are included in the Printable Games Package shown below. Teen Terror Mad Libs - Did you play Mad Libs when you were a kid? I know I did and so did my daughter when she was a teenager. Basically, players complete sentences by filling in blanks with silly words and end up creating non-sensical sentences that are hysterical when shared with other guests. 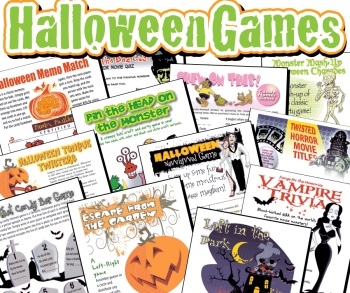 This particular Mad Lib is Halloween themed and comes as part of the Printable Games Package shown below. Printable Games Package - My friend Ashley created some fantastic printable theme party games including trivia games, word searches, scavenger hunts and Mad Libs. You won't believe how many occasions he covers; Halloween, Christmas, Super Bowl, BBQ, Valentines, Wine, Mardi Gras and Academy Awards, just to name a few. He even has a trivia game for every state in America. You can buy his printable party games individually or you can buy a multi-pack very inexpensively. You get the convenience of buying them online plus you can download them immediately and use them over and over again. Click here to learn more about Ashley's Python Printable Games. NOTE: Python is currently running a special. Buy any 2 games or packs and save 50%. Now is a great time to try them out. Use Coupon Code PUMPKINTWOFER when ordering. The Halloween themed multi-pack in particular includes the last three games above plus over 50 additional printable games and activities, suitable for Halloween, Fall Harvest and Thanksgiving. There are several games for all age groups so you will never run out of fun games to play with your guests. 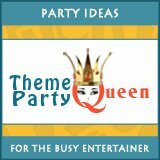 Click here to learn more about this printable Halloween Party Games package ready for immediate download.